Representatives for the yellow vests disputed the previous week’s numbers, claiming the turnout was higher. In Paris on Saturday, the protesters marched from the Champs-Elysees to the city’s parliament buildings, where a violent contingent broke down barriers and threw projectiles at police. 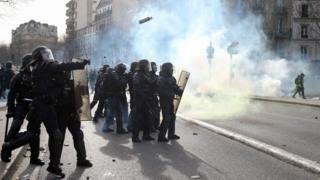 Police responded with tear gas and anti-riot munitions. Who are the gilets jaunes protesters?